An evening of rehearsed readings showcasing the talent we have here in Teesside. Act-Up Teesside brings to life, over 2 nights, a series of ‘mini’ plays – written and performed by actors and writers from Teesside, all about Teesside – with love, from Teesside! Ranging from the closure of Corus to a 1980’s beauty pageant in a crisp factory, this will be a wonderful opportunity to come and support the arts in our area as well as seeing some pieces of theatre, which have never been seen or heard before. Who knows you may learn something you never knew or even better, have a story to share with us for future plays! Thirteen minutes past is a culmination of work, which has been created in a variety of ways. 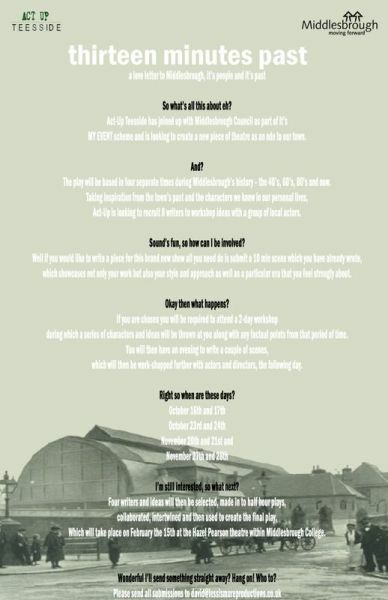 Some of the work has been created through a series of weekend workshops where actors and writers were asked to find headlines, photos and people stories from specific eras in Middlesbrough’s past. Alongside this process we asked other writers to submit pieces, which we then whittled down a couple of stories, which showed great promise. All the scripts have then been work shopped with the actors and after a few re-writes we have ’13 minutes past’. 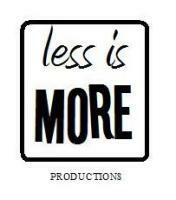 Produced by: less is MORE Productions.